High prices, raging drought, SNAP cut threats -- sometimes it's tempting to think the world is conspiring against us. There are a few indications, though, that sometimes it conspires for good. Good News Item #1: We've been demanding more fresh produce and buying less processed food, to the extent food manufacturers and supermarkets are sitting up and taking notice. This is a happy, healthy trend I'd like to keep going. The question is, wil it be sustainable with rising food costs? We shouldn't have to choose budget over health. This brings us to Good News Item #2: The national nonprofit Environmental Working Group has just released "Good Food on a Tight Budget." This free downloadable shopping guide helps you fill your shopping basket and plate with foods that pack the most nutrition for the lowest cost and are clean and green in the bargain. Speaking of green, that's what many of the good food values are -- leafy greens from spinach to kale. They're cheapest and most abundant now, in season, when they come straight to you from your garden, community supported agriculture program or farmers market. They're so fresh, so vibrant, so lovely, so healthy, so cheap. You harvest them or purchase them in a green rapture. And then you discover how much room they take up in your refrigerator. You will do something with them. Tomorrow. In the meantime, you take something else out of the fridge, the greens get shoved back. As the days progress, the greens are eclipsed from view and begin their slow descent into decay. By the time you reclaim them, they are not green but black, slimy and limp, and the thing you wind up doing is throwing them out. This is not good news and is wrong on so many levels. Globally, we waste more than a third of our food. In this country, each household tosses almost 500 pounds of it a year. Faced with high food prices and the very real threat of food scarcity, we cannot afford this on any level. A bargain, even a nutritious one, is only a bargain if you know what to do with it. The problem is, when it comes to greens, many people don't. Which brings us to Good News Item #3: "Wild About Greens," providing 125 recipes that make delicious use of your most nutrient-rich food value. 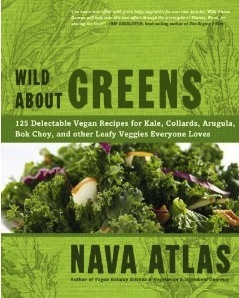 "People really need to know what to do when things are super abundant," says "Wild About Greens" author Nava Atlas. "You get a little bunch of arugula at the supermarket and it's fine. If you belong to a CSA, they want you to take your share. You have tons of arugula. When you give people too much of something they're not familiar with, they get bewildered." The VegKitchen blogger still remembers with a frisson of horror what she calls her CSA's chard explosion of 2009. But that experience "planted a seed -- no pun intended," which comes into full flower with "Wild About Greens." Look, I'm not going to lie -- a crippling drought, a struggling economy, we're being hit with a lot we can't control. They're signs offering us the opportunity to change. We have the power to help the environment, the economy and ourselves by choosing greens over meat. EWG's "Good Food on a Tight Budget" and "Wild About Greens" help keep a good food thing going. So can we. It's a green conspiracy for good we can all join. Recipe from "Wild About Greens," by Nava Atlas, copyright 2012. Used with permission by Sterling Publishing. You need only a salad and some crusty bread to accompany this hearty pasta dish, which abounds with greens of your choice. Cook the pasta in plenty of rapidly simmering water until al dente, then drain and transfer to a large serving bowl. If using any variety of chard, cut the leaves away from the stems and chop coarsely or cut into ribbons. If you plan on using the stems from chard, trim an inch or so away from the bottom, then slice thinly. If using kale, strip the leaves from the stems, and cut into narrow ribbons or small bite-size pieces. Thinly slice the stems if you plan to use them, otherwise, discard. Stem larger spinach leaves and chop coarsely; if using baby spinach, use the leaves whole. Heat the oil in a large skillet. Add the garlic and bell pepper and sauté over medium heat until the garlic is lightly golden and the bell pepper softens, about 3 minutes. Add the greens and stir in quickly to coat with the oil. If using spinach, cover and let it wilt for 30 seconds or so. If using kale or collards, add a couple tablespoons of water, cover, and cook for 2 to 3 minutes, just until wilted and bright green. Add the tomatoes, chickpeas, olives, and oregano. Stir together and cook, stirring frequently for 3 to 4 minutes, or until everything is heated through. Combine the mixture from the skillet with the pasta in the serving bowl and toss together. Toss with the skillet mixture. Season with salt, pepper, and optional red pepper flakes. 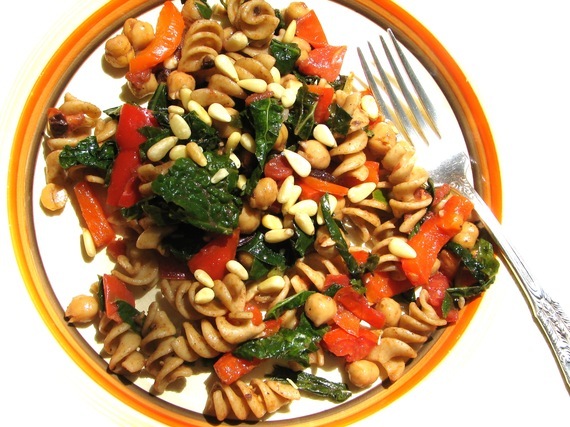 Sprinkle optional pine nuts over the pasta, and serve. This post originally ran August 27, 2012.